Image credits: Tupps Brewery, Fort Worth Aviation Museum. On Rotation, Dallas - 4 p.m. - Monday Night Flights. Selections vary. Hop & Sting Brewing Co., Grapevine - 6 p.m. - Charity Bingo benefiting Second Chance SPCA. Flying Saucer, Fort Worth - 5 p.m. - Release Party for Real Ale Firemans Light. Taps & Caps, Lewisville - 5 p.m. - Launch Party featuring variants of Karbach Bourbon Barrel Hellfighter. The Common Table, Dallas/Frisco - 6 p.m. - Pour Man's Beer Dinner featuring a flight of four brews paired with four courses for just $29. Meddlesome Moth, Dallas - 6:30 p.m. - Locals Beer Dinner ($80pp, click here to purchase tickets). On Rotation, Dallas - 4 p.m. - Cause It's Tuesday benefiting Dallas DogRRR. The Heritage Table, Frisco - 11 a.m. - $3 Pint Night featuring a rotating selection of Texas brews. The Common Table, Dallas - 5 p.m. - Brewsday Tuesday featuring beers from Firestone Walker. Scheduled to be tapped: Rosalie, Bretta Tangerine and Mind Haze. The Common Table, Frisco - 5 p.m. - Brewsday Tuesday. Selections vary. Barrel & Bones, Fort Worth - 6 p.m. - Tipsy Tuesday featuring brews from Rabbit Hole. Scheduled to be tapped: El Conejo and JubJub Tangerine. Kool Keg, Arlington - 6 p.m. - Pint Night featuring brews from 3 Nations*. Village Burger Bar Inwood, Dallas - 6 p.m. - Texas Craft Beer Tuesday featuring Karbach Love Street. Ginger Man, Dallas - 7 p.m. - Trivia Night featuring beers from Brooklyn Brewery. Alamo Drafthouse Cinema, Richardson - 7 p.m. - Hopped Up Cinema featuring brews from Peticolas and a screening of Pulp Fiction ($25.41pp, click here to purchase tickets). State Draft House, Flower Mound - 7 p.m. - Pegasus City Beer Dinner ($50pp, click here to purchase tickets). Lucky Lou's, Denton - 9 p.m. - Pints & Prints featuring brews from Rahr & Sons. BrainDead Brewing, Dallas - 3 p.m. - Put Sam in the Weeds/Growler Hour (click here for more information). On Rotation, Dallas - 4 p.m. - Clean Slate Wednesday. Selections vary. Rahr & Sons Brewing Co., Fort Worth - 5-7:30 p.m. - Midweek Tasting featuring half-pours of Fritz's Funkberry ($15pp at the door). Brü City Stadium, Arlington - 6 p.m. - Brü Night featuring beers from Martin House. Eno's Pizza Tavern, Forney - 6 p.m. - Peticolas Beer Dinner ($50pp, click here to purchase tickets). Lakewood Growler, Dallas - 6 p.m. - Flight Night featuring Saint Arnold Bishop's Barrel No. 12-16 ($15pp). State Draft House, Flower Mound - 6 p.m. - Texas Pint Night. Selections vary. What's on Tap, Keller - 6 p.m. - Pint Night. Selections vary. What's on Tap, Highland Village - 6 p.m. - Pint Night. Selections vary. Local Pint, Flower Mound - 7 p.m. - Avery Beer Dinner (call 214-285-3628 for more information). Ron's Corner Tavern, Bedford - 7 p.m. - Pint Night. Selections vary. Fort Brewery & Pizza, Fort Worth - 11 a.m. - Token Thursdays benefiting Just for J. Turning Point Beer, Bedford - 6 p.m. - Family Dinner with RA Sushi ($40-$65pp, click here to purchase tickets). LA Burger, Keller - 5 p.m. - Thirsty Thursday featuring brews from Rabbit Hole. Scheduled to be tapped: Rapture and Off With Your Red. Wise Guys Pizzeria, Grapevine - 5 p.m. - Thursday $3 Pint Night*. Selections vary. Wise Guys Pizzeria, Roanoke - 5 p.m. - Thursday $3 Pint Night*. Selections vary. Brass Tap, Allen - 6 p.m. - Salute Those Who Serve to benefit Warrior's Keep featuring brews from 3 Nations*. Holy Grail Pub, Plano - 6 p.m. - Dogfish Days of Spring featuring brews from Dogfish Head. Scheduled to be tapped: Festina Peche, Pennsylvania Tuxedo and 120 Minute IPA. Kool Keg, Arlington - 6 p.m. - Pint Night featuring brews from COOP Ale Works*. State Draft House, Flower Mound - 6 p.m. - Texas Flight Night*. Selections vary. Taverna Rossa, Southlake - 6 p.m. - Brews & Blues Tap Takeover featuring beers from Red Gap. Scheduled to be tapped: Gunsight Hefeweizen, Big Daddy Darryl Double IPA and Pretty Witty Amber Ale. Cork & Growler, Frisco - 7 p.m. - Trivia Night featuring brews from Armadillo Ale Works. Dot's Hop House, Dallas - 7 p.m. - Oak Cliff Beer Dinner ($40pp, click here to purchase tickets). Ginger Man, Plano - 7:30 p.m. - Trivia Night featuring brews from Rahr & Sons. Martin House Brewing Co., Fort Worth - 4 p.m. - Taproom Release of Who Wants Cream, the brewery's imperial coffee stout. Oak Highlands Brewery, Dallas - 5 p.m. - Family Night featuring food, games, non-alcoholic drinks and a movie for the kids. TKO Libations, Lewisville - 6 p.m. - Taproom Release of TKO Barleywine, the brewery's latest small-batch beer. The Bearded Monk, Denton - 11 a.m. - Arts and Jazz Fest Day 2 featuring brews from Community. Discover Denton Welcome Center, Denton - 7 p.m. - Free Beer Friday featuring brews from Community. 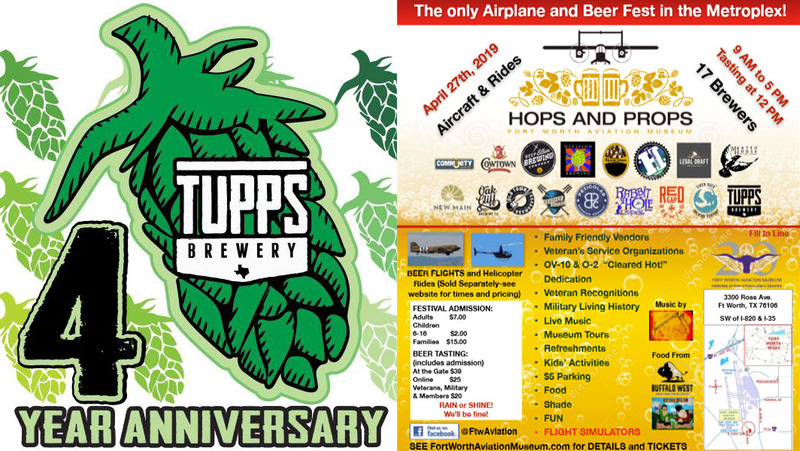 Tupps Brewery, McKinney - 11 a.m. - Four Year Anniversary Party featuring over 25 beers on tap ($25-$35pp, click here to purchase tickets). Celestial Beerworks, Dallas - 12 p.m. - Adult Science Fair & Odysseus Beer Release Party. Shannon Brewing Co., Keller - 12 p.m. - Arlo the Brewery Dog's Birthday Party benefiting Fort Worth Abandoned Animal Alliance. Woodcreek Brewing Co., Rockwall - 12 p.m. - Peace Keepers 6th Annual Car & Bike Show benefiting K9s for Warriors. Deep Ellum Brewing Co., Dallas - 3 p.m. - Pups & Pints benefiting Paws in the City ($20pp at the door). New Main Brewing Co., Pantego - 3 p.m. - Adoption Event with Dallas Pets Alive. Armadillo Ale Works, Denton - 6 p.m. - Launch Party for this year's batch of WunderMelon Watermelon Kölsch. Nine Band Brewing Co., Allen - 7 p.m. - Pop Up Beer Dinner with Chef Ken Patrick ($50pp, click here to purchase tickets). Fort Worth Aviation Museum, Fort Worth - 9 a.m. - Hops & Props featuring brews from 17 local breweries - beer festival begins at 12 p.m. (click here to purchase tickets). The Bearded Monk, Denton - 11 a.m. - Arts and Jazz Fest at Day 1 featuring brews from Santa Fe. LUCK, Dallas -11 a.m. - 6-Pack Trail, Bike Cruise & Craft Beer Tour ($55pp, click here to purchase tickets). Lakewood Growler, Dallas - 3 p.m. - Beer & Cheese Pairing with Manhattan Project ($15pp at the door). 3 Nations Brewing Co., Farmers Branch - 11 a.m. - Brewery Brunch with Proper Banking Co. ($50pp, click here to purchase tickets). Cowtown Brewing Co., Fort Worth - 1 p.m. - Pinwheel Society's Annual Chili Cook-off benefiting Alliance for Children (click here for more information). Legal Draft Beer Co., Arlington - 1 p.m. - Bundts & Brews Pairing ($15pp, click here to purchase tickets). Old Town Brewhouse, Lewisville - 1 p.m. - Pints for Peglegs benefiting Flower Mound Firefighter Chad Edgar ($10-$25pp, click here to purchase tickets). Rahr & Sons Brewing Co., Fort Worth - 1 p.m. - Mudbugs & Music ($30pp, click here to purchase tickets). Peticolas Brewing Co., Dallas - 1:30 p.m. - Beer & Donut Pairing Flight with Hypnotic Donuts ($20pp, click here to purchase tickets). BrainDead Brewing, Dallas - 4:20 p.m. - Crawfish Boil ($25pp, click here to purchase tickets). The Bearded Monk, Denton - 11 a.m. - Arts and Jazz Fest at Day 3 featuring brews from Armadillo Ale Works. Pop Up Beer Dinner at Tap & Caps Fort Worth, May 1. Craft Beer Class for Women (& Men) at 3 Nations Brewing, May 2. Eleventh Anniversary Party at Franconia Brewing Co., May 4. Fourth Annual Tap Fest at Texas Ale Project, May 4. Tunes, Tails & Ales at Murphy Central Park, May 4. Fort Worth Beer Festival at The Yard, May 11. Six Year Anniversary Party at 903 Brewers, May 11. Third Annual Sour Fest at Martin House Brewing Co., May 11. Beer, Bourbon & BBQ at Hilton Rockwall, May 16-18. Four Year Anniversary Party at Ivanhoe Ale Works, May 18. Dallas BrewHaha in Bishop Arts District, May 19. Three Year Anniversary Celebration at The Thirsty Growler, May 25. Eno's Brew Riot in Bishop Arts District, May 26. Little Elm Craft Brew & Que Festival at Little Elm Park, June 1. Seventh Annual Father's Day Tour on Dallas Brew Bus, June 15. Grand Opening at Krootz Brewing Co., June 15. Denton Beer Walk at Denton Downtown Square, July 15. *Buy the beer, keep the glass - while supplies last.